Eucalyptus oil is usually pretty good at removing sticky residue. Obviously, test it somewhere hidden on the hat first. Thank you for posting this. 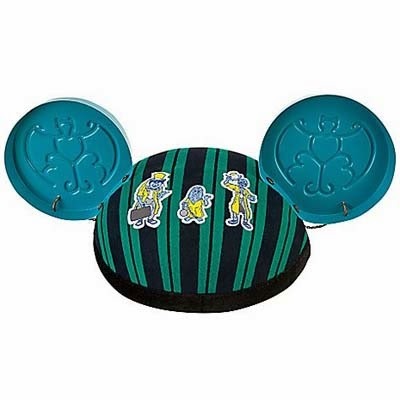 Haunted Mansion is my favorite ride so I had to buy the ears, but those plastic teal pieces don't do the feeling of the ride justice. Maybe put a little brass "999" on the back. For the 999 spirits who live there. Is that dumb? Not at all - I like it! I can't really make out what the pin is (my eye sight is horrible) what kind of pin is it? I've had excellent success getting all kinds of glue and sticky goo off with WD-40. Seriously. It changes the texture of the goo so it's suddenly easily wiped off with just a paper towel. Just cover it up with your metal/copper tape embossed with whatever design you think suits it. that way you don't have to slave away removing the sticky bits from the "ghosts". 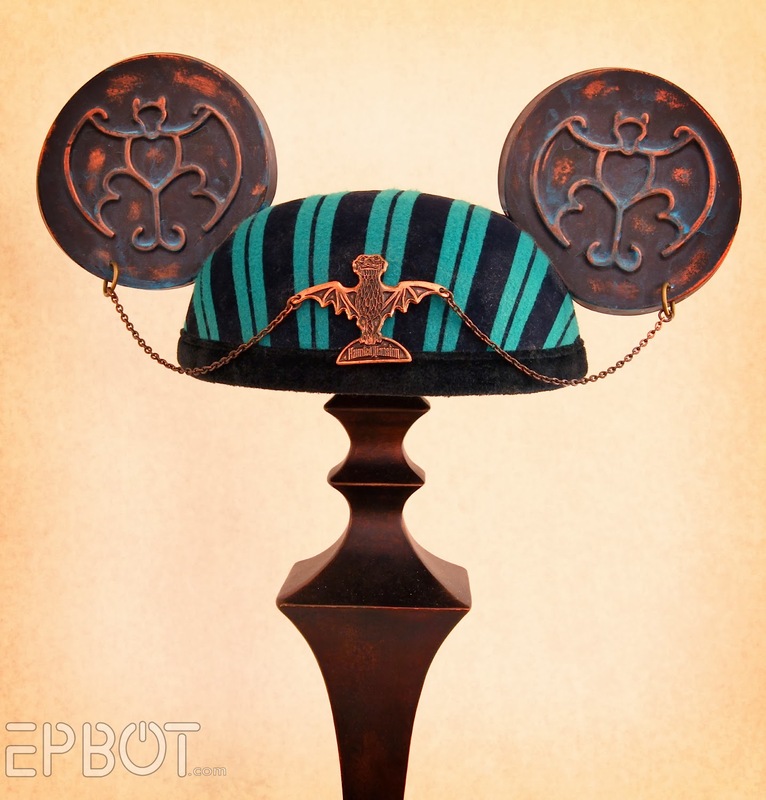 I've never been to Disney so I don't know anything about the Haunted Mansion other than what you say here, but I firmly believe that gears and gems look fabulous on everything! Wouldn't simply cutting the offending patch out and making BRAINS to fill the hole be the most appropriate solution to your ghost problem? You could even go with something glow in the dark. How about a few smashed pennies with a similar chain connecting them together? For some reason I keep seeing a black veil in the back. Could be fun, especially with some copper "sequins". I vote for Ann too, since the bride theme goes along with the ride! I second Tiffany's comment for the 999 Happy Haunts! 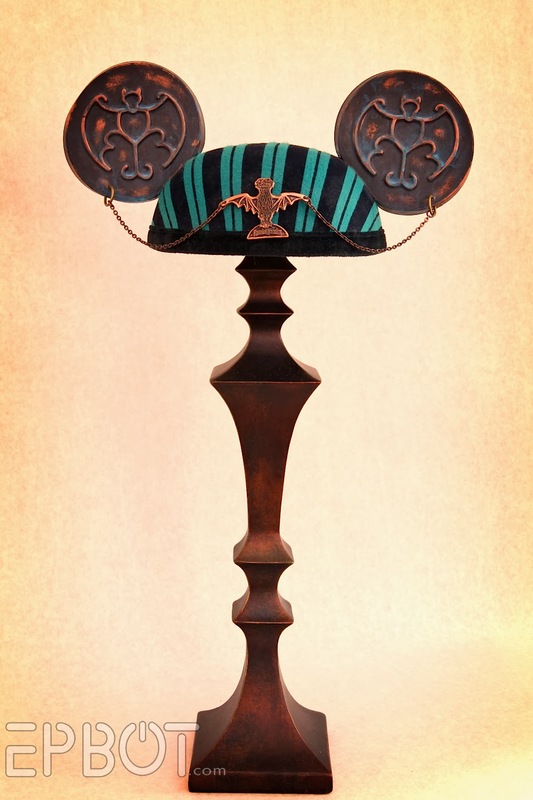 You could use your metal tape idea in copper to make it look riveted to the hat. Hi! Can you please tell me how you made such a dramatic dome in you penny buttons? Hi Shannon! I used a doming block for those; you can see it in this post. 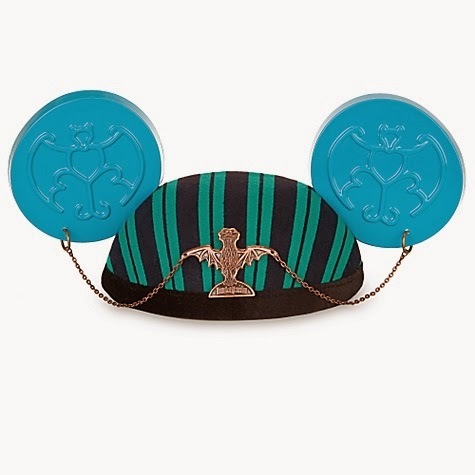 I'm pretty excited to do this because I have the same ears and I have my first mickey ears from my first visit so it's a creative way to display them! So cute Jen - Love the copper ears!! Did you add anything to help the hat stand still on the candle holder? Maybe stitch Gracey on the back, like the fabled owner of the Mansion got a pair of ears? Those ears are awesome! Way better than the original! To cover up the gluey bits ... hmmm ... how about a black bat like the housekeepers have on their caps? Or could you somehow attach a picture of the looming demon candle holders from the Stretching Room? Put in your favorite tombstone? Or the skeletal wolf from the graveyard? The raven? How about the words 'Hurry ba-ack' in metal work?